Despite the hot temperatures, Sally Begue (left) and Penny Westfall were excited to pick up their race bibs for the first race in the series. People who want to make exercise a habit often find that buddying up with friends increases their odds of success. That’s one of the reasons Sally Begue, gift shop supervisor, and Penny Westfall, patient accounting, decided to get social. 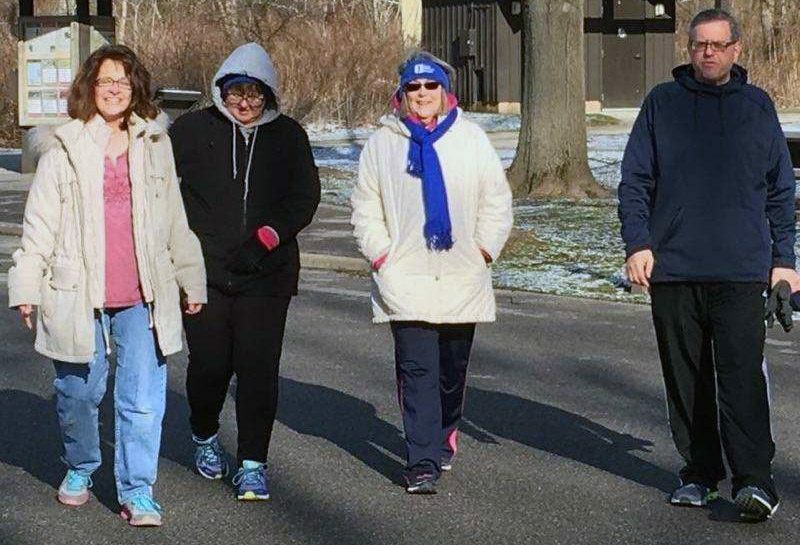 The 2 friends teamed up together to join the Blue Line Beginners, a free Akron-area club of walkers/runners. 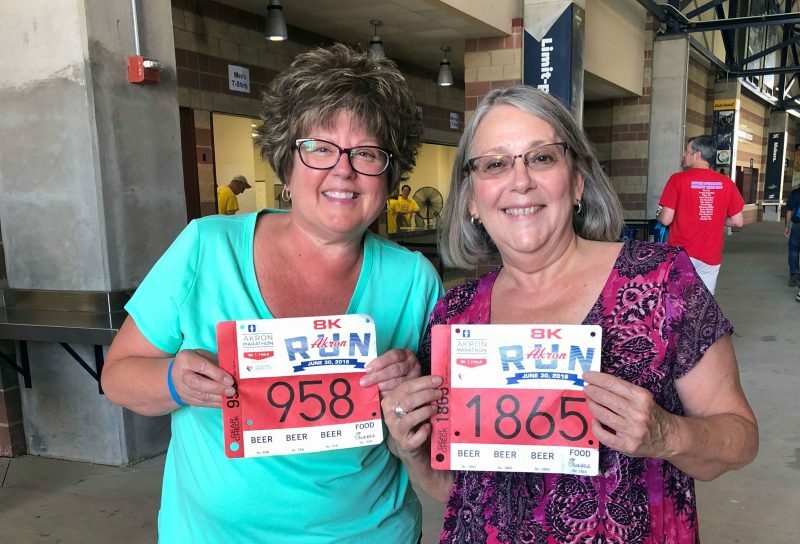 Now, weeks later, they’re training for the first race in the Akron Children’s Hospital Akron Marathon Race Series: National Interstate 8k and 1 Mile on June 30. When Sally asked Penny to join Blue Line Beginners, Penny jumped at the chance. Sally and Penny (center) walk with other Blue Line Beginners. 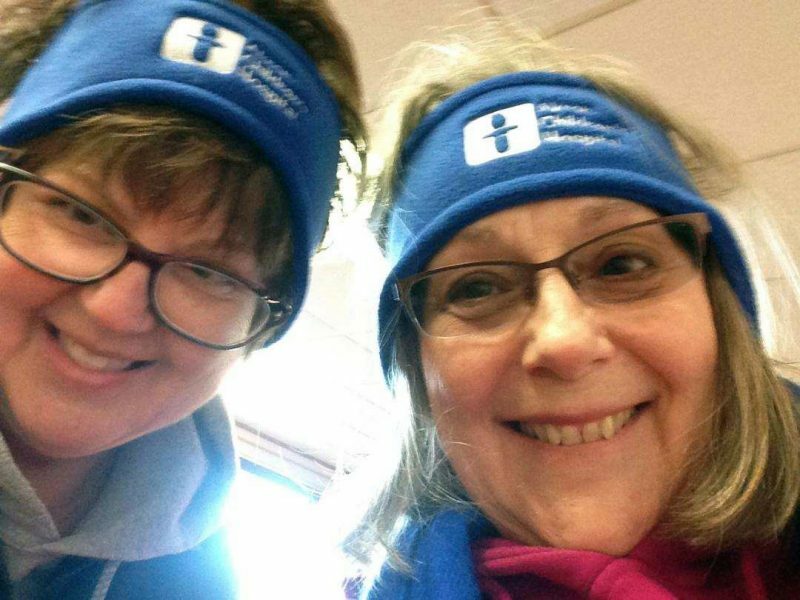 On a cold Saturday in March, Sally and Penny, along with 110 others, attended the Blue Line Beginners kick-off meeting to learn what they would be doing for the next 6 months to prepare for the 3 races in the Akron Children’s Hospital Akron Marathon Race Series. They received a training schedule to follow and got advice on how to build endurance and avoid injuries. Neither Sally nor Penny exercised regularly then, but they do now. Most Saturdays, they meet other Blue Line Beginners at different parks in Akron to train. During the week, the 2 women meet to walk during work breaks or train on their own after work. They’re also strength training or adding cross-training activities to their normal walking routine. Penny joined a gym and began working out with weights regularly, which is new to her. Sometimes, regular exercise is tough. Other times, Sally and Penny notice aches and pains that weren’t there before. But both are determined to leave their sedentary ways behind. The encouragement from Blue Line club members helps. So does setting specific goals. Besides increased endurance, Penny has made an effort to drink more water and stay hydrated, which she didn’t do before. For Sally, her goals are physical and personal. She is quickening her pace and noticing more energy as the weight and inches drop off. She is also walking to memorialize her mom, who died recently. Interested in running, volunteering or cheering on the participants in the 2018 Akron Children’s Hospital Akron Marathon Race Series? Visit akronmarathon.org. Running season is upon us: Social worker asks what's your why?